Head pressure control is used in many refrigeration system where the application requires the system to operate most of the winter season. Essentially, the head pressure control setpoint changes as the ambient (outside air conditions change). 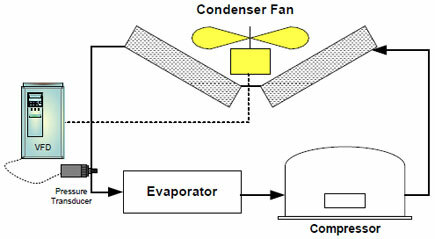 Energy savings are realized if the condenser is allowed to operate at the lowest possible condensing temperature. The compressor does not need to work as hard and there are savings by employing a frequency inverter. Using accurate PID control increases the systems efficiency. Another method to control head pressure is to allow the head pressure to float a fixed differential temperature above the ambient. The pressure is allowed to float based on the load.